A review of Death Note over at Salon! I'm in San Diego, and... there sure are a lot of people here. My. Really, there are an awful lot of people here. I just took up Idolator's challenge to condense "Lily, Rosemary and the Jack of Hearts" into a limerick in this Zoilus post... only to find that Carl had already done it better. Steve Duin at the Oregonian! The comics panel at The Onion! Jeet Heer in The Globe and Mail! Lewis Shiner in the Raleigh News & Observer! Michael Sims in the L.A. Times! The fabulous Cecil "Seaskull" Castellucci just posted my "mix tape" of ten amazing punk YouTube videos over at Beige Is Punk! My first post at The Savage Critic(s) wasn't about Essential Defenders after all--it's about Giant-Size Marvel Adventures The Avengers #1, except actually it isn't. And thanks to Amadeo over at El Baile Moderno, there's an interview with me in Spanish. The Spanish isn't mine, by the way. A bunch of errors crept into the first printing of Reading Comics. (I say that in a passive sort of way, but in fact I put all of them there.) In the spirit of Franklin Bruno's Adcidents Will Happen, I figured it'd be wise or at least useful to have a "virtual errata slip" online until I can correct them in future editions. Pg. 83: With regard to the "Journal of MODOK Studies": "MODOK" is a "Mental Organism Designed Only for Killing," not a "Mechanical Organism...," and there are three issues to date, not "at least four issues." Thanks to Ben Towle for the correction. Pp. 158 etc. : Diana Schutz kindly notes that it's "Eisnershpritz," not "Eisenshpritz," and that it was named by Harvey Kurtzman. Pg. 229: There shouldn't be a comma after "pseudonyms" ("Curt Vile" and "Jill de Ray" were pseudonyms rather than strips). Pg. 367: The most embarrassing one by far: as Jeet Heer wrote me to point out, "the late underground cartoonist S. Clay Wilson" is very much alive. My apologies to him and to anyone misled by my error. Links keep popping up! Whitney Matheson of USA Today interviewed me for her Pop Candy podcast; there's also a little excerpt from Reading Comics there. Plus a plug for Keven McAlester's Roky Erickson movie! And Nextbook.org has a piece I wrote about Douglas Rushkoff and Liam Sharp's Testament. Gabe Roth has some kind things to say about Reading Comics, too. Thank you, Gabe! Yes: that is not Fat Day themselves, but a Japanese Fat Day cover band. In Tokyo. Playing songs from Fat Day IV. In further Fat Day-related news, the new Dark Beloved Cloud Singles Club CD single just arrived from the plant: a split EP with Melt-Banana, on which both bands do Devo songs. Please start preparing for your mind to be blown right now. 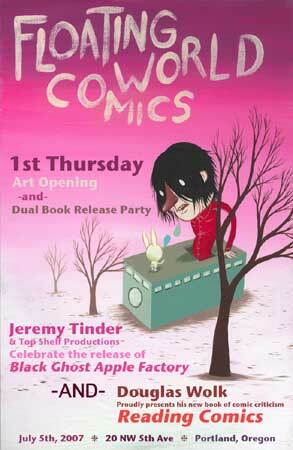 book release party this Thursday!